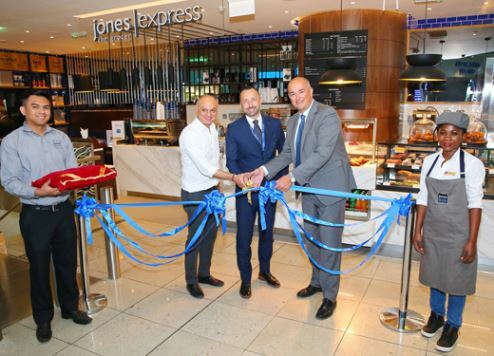 Passengers can now enjoy artisan food adjacent to their boarding gate following the launch of gourmet brand Jones the Grocer’s express concept in Dubai International (DXB) Terminal 3 B Gates. It’s the first in a series of unique bespoke food and lifestyle concepts to be rolled out at the world’s busiest international airport as it strives to transform the passenger experience and make the airport a destination in its own right. In keeping with its desire to provide the best gourmet food for everyday living, Jones the Grocer’s DXB outlet serves its popular single origin coffees, croissants, muffins, sandwiches, salads, soups and hearty mains. All items are made fresh daily and packaged for take away, perfect for passengers preparing to board their flights. Designed in a fashion that showcases Jones’s trademark contemporary yet casual décor, the café also features seating for customers that want to enjoy delicious refreshments in stylish surroundings. Eugene Barry, executive vice president – commercial and communications, Dubai Airports, said: “We’re delighted to welcome Jones the Grocer to DXB. Its express concept dovetails perfectly with our plans to expand the variety of ‘grab and go’ food concepts. The launch strengthens Dubai Airports’ long-running partnership with the world’s largest airport food and beverage operator, HMSHost International, which manages the outlet. “The partnership with Jones the Grocer enables us to let guests at this dynamic global hub experience the Australian-born, gourmet retailer, award-winning café and bakery, with menu items featuring ingredients produced by specialist, artisan suppliers and items baked on site by the team,” said Walter Seib, CEO of HMSHost International, which serves as the operator. Jones the Grocer opened its first store in the inner-Sydney suburb of Woolahra in 1996. It now has stores across Australia, New Zealand, Singapore, Thailand, Qatar, Bahrain and the UAE. Jones the Grocer Express Dubai International is located in Terminal 3 B Gates. DXB now offers more than 150 eating options for passengers, catering to all tastes and budgets.